Autographed signed letter from Chief Justice Warren Burger to the Chief Judge of the Second Court of Appeals Irving Kaufman on The Supreme Court letterhead. The letter reads, “Dear Irving, Today is a significant milestone in your fine judicial career and an important one in the Judiciary because of that fact. Few judges brought to their work the rich background of scholarship and broad experience in practice and the trial bench as you did. I wish for you- and for all of us- that you will have good health and many more years of service in the courts. 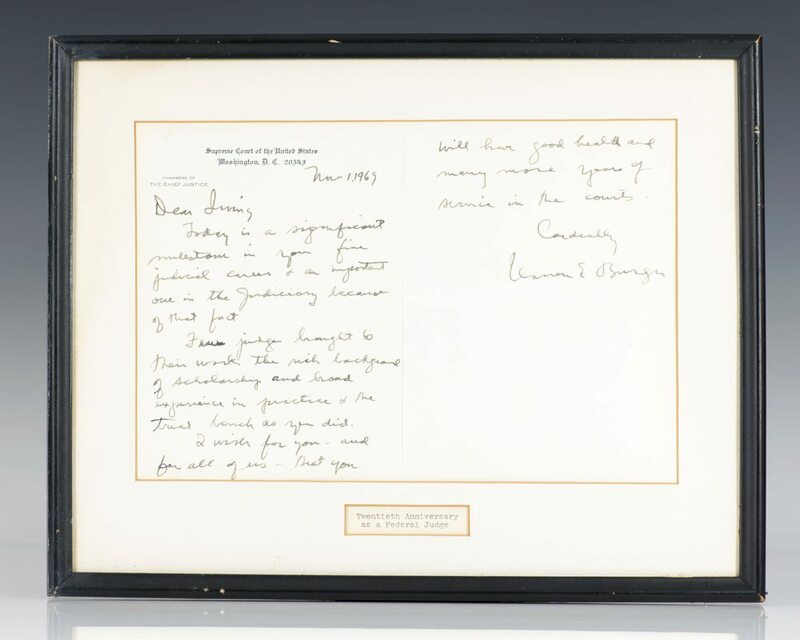 Cordially Warren E. Burger Nov. 1, 1969.” Matted and framed. The entire piece measures 11.75 inches by 14.75 inches.